Rise and Shine Cafe is a cute little cafe that is located in the Reid Building plaza. They offer wonderful homecooked meals, such as breakfast options (breakfast sandwiches, omelets, etc. ), lunch options (sandwiches, wraps, soups, etc. ), dinner options (entrees such as BBQ Baby Back Ribs, Tilapia, Bourbon Rib-Eye Steak, etc. ), desserts, and drinks (soda, milk, and teas). The hubs and I stopped by to have lunch, and we tried the following: ‘Slap Ya Mama’ Fries (french fries topped with a generous amount of shredded melted cheese, bacon bits, and your choice of ranch and/or sour cream; with the ranch sauce, it was yummy; while this app was filling, it wasn’t overly greasy! ); Homemade Cream Chip Beef over Toast, served with Homefries (the hubs was a total fan and thought this was one of the best chipped beef dishes he’s had! This had a great creamy taste, filled with a generous amount of chipped beef; the slices of toast were a great complement; I was such a fan of the homefries, as they were sliced thinly, crispy, seasoned wonderfully, and had some great sauteed onions mixed in! ); a Classic Jumbo Lump Crab Cake Sandwich (you can choose for the crabcake to be broiled, fried, or blackened; we opted it to be fried; the crabcake was tasty and seasoned well, with pretty much no filler; this came with a side of yummy and creamy rémoulade sauce that had a nice zippy tang to it, and a generous amount of fries); Southern Maryland Fried Chicken (4 pieces that included a thigh, a breast, a wing, and a drumstick, this had a seasoned batter and was moist; we both thought it was okay; the entree also came with a choice of 2 sides – we chose mashed potatoes and gravy (this came out super super hot, and I loved this – creamy and delicious!) and macaroni and cheese (the hubs was a fan); and, a Backyard Burger (topped with slices of ham, bacon, leaf lettuce, tomatoes, onion rings, and chipotle mayo – the patty was handformed and delicious; while this burger was generous in the toppings and its size, I think a regular bacon cheeseburger would have been just fine for me! ; this also came with a side of fries). I also tried their homebrewed sweet tea that had a nice sweetness to it. We were a little sad that the desserts had run out, but that just gives us an excuse to return again, very soon! This lovely establishment is run by Ms. Dianett and Ms. Danielle – both were so so so super sweet and welcoming and checked up on us to make sure that everything was great. This is definitely a hidden gem in the Owings area, and I highly recommend in making the trek to get yourself filled with a lovingly-prepared, satisfying, and comfort fare. I can’t wait to return to try out their meatloaf, their Bourbon Rib-Eye Steak, and their desserts! I SO SO SO WISH that Nubohemia was located closer to home! This cute awesome local coffee shop is all about being connected to the community – they love supporting local artists and musicians, while serving up some great hot and cold beverages and pastries. The hubs and I came in here after having a meal, and we both fell in love with the place! I had one of their Salted Caramel fraps (not too overly sweet, right amount of crushed ice, and pretty tasty), and the hubs had a mug of hot lemon & ginger tea (very soothing!). Mr. Brandon, one of the main baristas, welcomed us warmly, was super friendly, and was really super cool! The cafe itself has a small number of tables and chairs, but it’s a perfect kind of quiet and an intimate place to do some work, study, read, relax, and/or enjoy a drink and a pastry. I loved the music that was playing and enjoyed checking out the artwork on the wall (which are also available for purchase). Everything was clean, organized, and cozy – I’d love to come back to check out their in-store events as well as to try out more of their beverages. I highly recommend this little gem – you won’t regret it! Martin’s Soul Food and BBQ is located in the Safeway plaza off of Bryans Road. They’ve only been opened for a few months and offer a variety of soul food and BBQ options (pork and beef rings, brisket, pulled pork, wings, subs, burgers, etc.). The hubs and I came here for lunch, and we tried the following: Beef Brisket (this wasn’t too fatty and it was super tender and moist – the taste was pretty delicious, and the hubs was a total fan! ), Pulled Pork (with a little kick, this was meaty and it didn’t have any of the strong ‘pork’ odor – I loved finding the little end crispies and it was great with the side of spicy BBQ sauce), Porkchop (you can choose between smothered or fried – we opted for the fried version – this was just okay, as it was smaller than the typical deep-fried porkchops we are used to; it also wasn’t too flavorful), Wings (simple, fried wings that was great with the Texas Pete hot sauce), Ribs (there are pork or beef versions available – we opted for the pork; these were super juicy, had a lovely crisp exterior, and it was meaty and not too much fat; great with the spicy BBQ sauce), mac and cheese (the macaroni was fully-cooked and the cheese sauce was creamy; there was a bit of black pepper to give it a slight kick), sweet corn (the hubs liked this, as he is a huge fan of sweet corn), potato salad (this was just okay, as it was more tangy than creamy), collard greens (simple; I just wished there was a little bit of meat in there and a bit more seasoning), a Half Smoke (perfectly-halved and -smoked, this was pretty delicious! You can add toppings, but I chose only the grilled onions; yum! ), and a cup of Banana Pudding (housemade, this had a generous amount of banana slices within). Staff were super friendly and attentive, and there were a handful of tables to sit and dine. Just make sure you re-check and re-confirm your orders, as if the manager is not on-site, you are unable to get price adjustments/refunds. I’d love to come back and try out their subs and burgers, but I’ll definitely be back for the ‘Q! Check this cute local place out! +Half Smoke with grilled onions! Joanne’s Grill is a small casual fast-food grill place that serves both American and Korean eats. Items such as cold/hot subs, breakfast platters/sandwiches, club sandwiches, bulgogi platters, and cold/hot beverages are available. The hubs and I came here for a quick dinner before attending an event in the area, and I’m so glad that we did! We tried: the Bulgogi Platter (this came with a side of white rice and a cup of kimchi; the bulgogi itself was just way too sweet for my taste; while cooked perfectly, I was just not a fan of how overly sweet it was; the rice was also a bit too mushy and overcooked, but I did enjoy the generous cup of perfectly-fermented kimchi! ); a Bibimbop (this came with little bits of bulgogi and a generous mix of Korean vegetables – the chojang sauce was okay and not too spicy; the hubs actually thought both items were decent); an order of pan-fried Mandoo (not housemade, but these are smaller in size and pan-fried really well; the side of a soy sauce mixture was just way too sweet, so regular soy sauce or just eating on its own is advised); and, a Kimchi Quesadilla (this was SO BOMB! The thin tortilla was crispy and ‘fried’ perfectly; in between nestled just copious amounts of sauteed kimchi with the perfect crisp on its edges (the kimchi was perfectly well-fermented, which made this dish even more awesome! ); the cheese was not overwhelming, but it was a great ratio to the kimchi; the quesadilla is definitely on the spicier end, but this was just super delicious!!! Definitely the best kimchi quesadilla I’ve had!). The place is known for their Bulgogi Sub, but I’ve never been a fan of this concoction, and knowing how overly sweet the meat is, I’m glad I didn’t order it. The owners are super friendly, super welcoming, and oh-so-cute! There are some counter seating available, but most locals seem to take their orders to-go. I’d love to come back and try out their other menu items, such as the wings and the hot subs. Their storefront was also featured in House of Cards (Season 4), so I thought that was pretty cool! Rick’s NC BBQ is owned by Ricardo, but Ms. Chrissy and her son, Michael, runs the place. This small carry-out place offers BBQ pork ribs, sandwiches (pit beef, chicken salad, chicken breast, rib sandwich, and rib dog), NC pulled pork, fried/baked chicken, chicken strips, wings, shrimp, BBQ meat by the pint, kid options (nuggets), various sides (cole slaw, wedges, beans, corn nuggets, mac n cheese, collard greens, and potato salad), and party tray/catering options. The hubs and I came here for lunch, and we tried the following: 1/2 Slab of Ribs Platter (this is dry-rubbed, the ribs were pretty okay, but a little too fatty for our liking – we’d probably ask for a leaner cut next time; comes with the NC vinegar sauce as well as the sweet sauce; the platter also comes with your choice of 2 sides (we opted for corn nuggets and collard greens; the corn nuggets were little deep-fried nuggets filled with cheese and sweet corn – more sweet than savory; the collard greens was fantastic with the vinegar sauce, as it gives that nice little Old Bay kick to it – was pretty addicting! ); NC Pulled Pork (cooked perfectly, this was super moist and had some nice exterior crispies – great with the sweet sauce, but the hubs preferred the vinegar sauce); a 4 oz Pit Beef Sandwich (I absolutely LOVED LOVED LOVED this sandwich! I’ve tried the pit beef in Baltimore, and I was just not a fan; however, Rick’s version was juicy and flavorful, in thick-cut slices, and the 3 sauces that came with (the chipotle, the creamy horseradish, and the sweet sauce) just pushed this sandwich out to another dimension!!!). The bun that was used (Martin’s Potato Roll, I believe), was soft and fresh, and really held the meat well together. This was super delicious, that I had to get the bigger version, the ‘7 oz Big Momma Pit Beef Sandwich, with extra sauce, of course!!! We also tried the Chicken Platter (this was more of like a baked chicken – thin crispy skin, seasoned well, but very simple and not greasy; I just wished there was some type of a better hot sauce than Tabasco! ; this also came with a choice of 1 side, so we opted for the mac-n-cheese (I wasn’t a fan of this, as it wasn’t a thick creamy kind that I usually prefer it being). We added some wedges (a little less crispy, but you can request them to be prepared more crispier), beans (slightly sweeter, I enjoyed the little bits of white onion throughout), and the potato salad (more egg-y and tangy, this was creamy and yummy). To wash it all down, we had their house-brewed Sweet Tea – this was quite refreshing with the perfect amount of sweetness! Service was super friendly – Ms. Chrissy and her son, Michael, were sooo incredibly sweet and awesome! This little gem is worth checking out! I can’t wait to go back to get more of their Pit Beef sandwiches and try out their fried seafood and wings! +Pit Beef sandwich with the 3 sauces!!! Silk Road Choyhona offers delicious Uzbek cuisine in Gaithersburg! The menu offers a variety of appetizers, soups, salads, side dishes, shish kabobs (lamb, beef, veal liver, salmon, veggie, shrimp, etc. ), main entrees, fish dishes, desserts, drinks, as well as daily specials. The hubs and I tried the following: a Chiburekki (deep-fried turnover with a filling of ground beef and onions, served with a cup of cold sour cream sauce; think of it as a large thin empanada with a crispy exterior and filled with seasoned ground beef and onions; the cold tangy sour cream sauce is a great complement to the right-out-of-the-fryer crispiness! ), a Khachapuri (a cheese-filled pastry, baked in the oven; these look like dessert pastries, with a very flaky exterior and filled with a tangy, creamy cheese filling; tasted similar to labneh), a skewer of the Chicken Kabob (I love how you can order by the skewer and not forced to get an entree! Uses dark meat; the meat was so juicy (you can literally see its juices just dripping off the skewer! ), had a slight tang to it, seasoned perfectly, and sooo delicious!!! Served with a side of pickled onions and a marinara-like sauce (that you don’t need! )), Plov (a traditional Uzbek rice dish with pieces of boneless lamb, shredded carrots, garlic, chili pepper, and raisins; the rice was perfectly cooked, and it was so buttery and covered with the lamb juices, it resulted in a wonderful rice dish; the lamb was not game-y at all, but seasoned perfectly and great with the rice), and a pitcher of their homemade fruit beverage (made with strawberries, blueberries, sour cherries, and blackberries, this was refreshing, but tasted similar to the ones from juice boxes). Just note that the meats in Uzbek cuisine is cooked thoroughly, so some may find it a tad bit too well-done; I’m totally fine with it and actually prefer it this way! Our server was Greg, and he was very friendly and very sweet! The place does get busy, though, and there can be some lag in the delivery of the food and/or in receipt of the boxes/the receipt. The food is made-to-order, so keep that in mind! I’d love to come back and try out their other skewers – this place is definitely worth many repeats! SLAB-O-RIBS is currently open for the season, guys!!! This very unassuming shack off of Livingston Road offers the best ribs EVER! Mr. Joe, the owner, is oh-so-awesome and very passionate about his ribs and his homemade sides (like potato salad, collard greens, mac & cheese, baked beans, etc.) – and, rightfully so, as his food is sooo delicious! If you’re lucky, he sometimes has hot-out-of-the-oven yellow cake and rum/whisky cake available (next availability will be during Memorial Day weekend!). 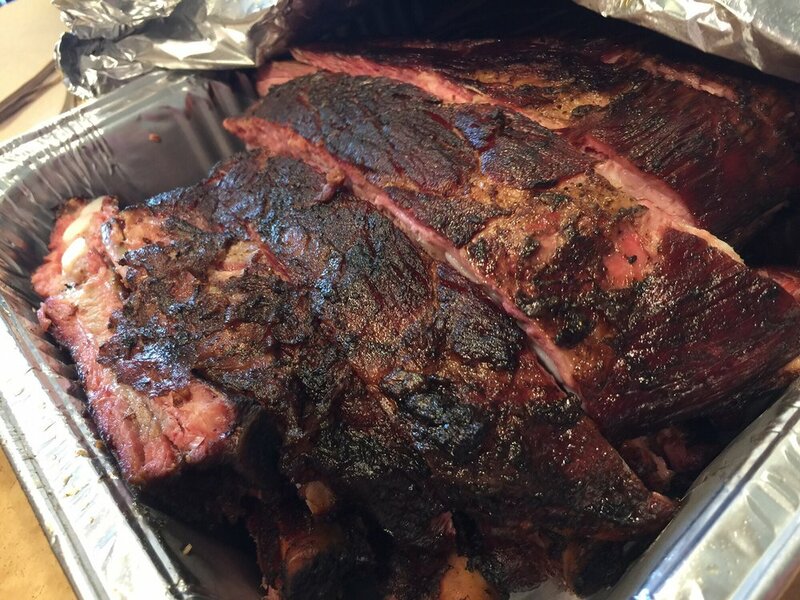 We always get a couple of slabs of ribs, hot BBQ sauce on the side (mild sauce is also available), and family-sized sides of the collard greens, potato salad, mac & cheese, and the baked beans. The ribs are fall-off-the-bone tender, has a lovely crispy exterior, and that lovely color within. The homemade BBQ sauce also takes it to a whole another level, but the ribs themselves are flavorful as it is, so sauce is technically not needed! Don’t forget to ask if they have NC-style pulled pork, as that is just so moist and so flavorful – don’t forget to get a cup of their coleslaw for that nice creamy crunch complementing situation! They have outside seating available, but we usually take it to-go. One of my favorite places EVER, we’ve been bringing all of our dear friends, and they all become Mr. Joe’s fans right on the spot – SNAP* Check out Slab-o-Ribs – you won’t be disappointed!